Hugo Van Der Goes was born in Ghent. 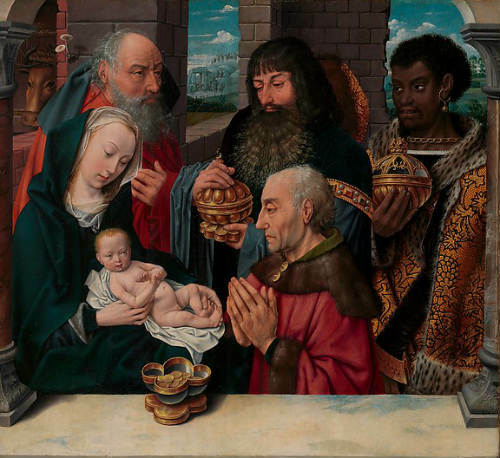 He became one of the most important Northern Renaissance painters working in Ghent. Like many painters of his time he signed very few paintings. In the 15th century Ghent was one of the epicenters of creativity, learning, architecture, painting, ironworks, literature and commerce. Author Walter M. Gallichan describes Ghent in the time of Hugo Van Der Goes, "Ghent was early a stronghold of powerful trade guilds, and one of the meeting-places of these unions was in the Market Square. These organisations of craftsmen were probably established first by the Flemish weavers to protect the woollen industry. All over Europe the guilds were instituted by artisans working in walled towns during the Middle Ages. Chaucer mentions them in England in his day. The guilds had their masters or wardens, who exercised an almost despotic sway over the members, and watched their interests zealously.